Sikkim team for the upcoming the National Football Championship for Santosh Trophy left for Siliguri for further training on Friday. The training will start at SSB complex at Ranidhanga in Siliguri from Saturday morning. Sikkim team members have been accompanied by its chief coach, Bhaichung Bhutia, assistant coach, Suren Chettri and team manager, Arjun Rai. During the training period, the state team is also scheduled to play friendly matches against SSB on January 22 and against Kanchenjunga Football Club on January 25. 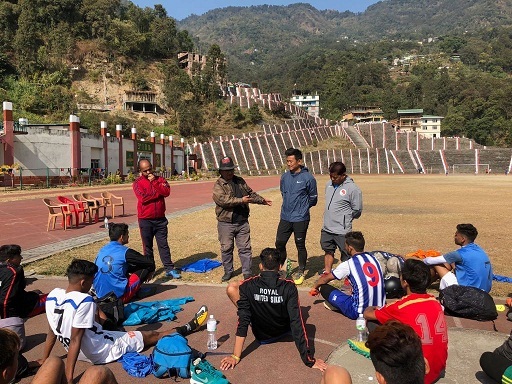 It has to be mentioned here that the state team had a week-long training camp at Siliguri last week followed by another three-day training at Khel Gaon complex at Gangtok. It is informed that the state team will directly proceed for the championship from Siliguri on January 25 evening. Sikkim has been placed in the East Zone for the first round of the championship to be started from January 28 at Patna in Bihar. Sikkim has been placed along with West Bengal, Bihar, Odisha, Chhattisgarh, Jharkhand and Railways in the first round.